Whether you’re a fitness guru or someone who simply works out a couple of times a week, you likely know the importance of listening to music while you exercise. Music has been widely credited for improving mental focus, commitment, and even stamina and endurance. However, the method in which you listen to your favorite tunes is something to remember. Headphones are often the most ideal choice, but the truth of the matter is – not all headphones are created equally. Over-ear varieties are often heavy, clunky and are simply too much to deal with when you’re sweating profusely or in the middle of long jog or bike ride. This is why most people choose in-ear headphones, also known as ear buds. They’re lightweight, fit more securely and have features that are specifically designed for working out. But still, one problem remains – how do you know which pair is right for you? If you’ve done some earlier research or shopping around, you’ve likely discovered the new TaoTronics TT-BH07U Bluetooth Ear buds. Known for being inexpensive and budget-friendly, we purchased them to test them out for ourselves, to see what they’re truly capable of. Today we’re going to be going over their distinctive features and decide whether they’re a worthwhile investment for those who may be interested in choosing them. 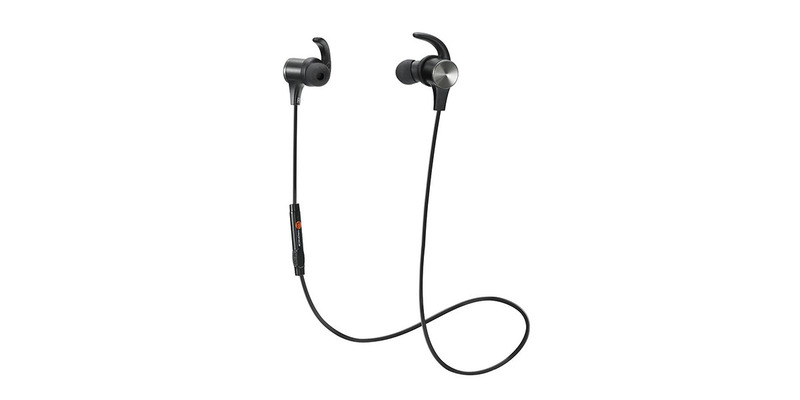 From head to toe, it seems that the TaoTronics TT-BH07U Ear buds have been created to match well with anyone who wants a reliable, inexpensive pair that’s built specifically for working out. Weighing in at just half an ounce, they’re incredibly lightweight and simple in their design. They’ve been given a minimalistic feel that consists of two ear buds with a small cable between the two. Each ear bud is solid to the touch and made out of a unique metal alloy construction, giving it a high-end look and feel that you won’t see in most headphones within the same price-point. Attached to each ear bud is a hook that positions them within your ear canal comfortably whilst ensuring they do not come loose or fall out. One of the most important characteristics of any ear buds used during workouts is that they stay snug and firmly within your ears; all the while not causing any discomfort. Taotronics have included 3 different sized ear tips and hooks which can be freely interchanged; enabling you to effortlessly get a comfortable fit, no matter what size your ear canals are. We tested them out during a various workout patterns and intensities to get a feel for how secure the ear buds stay in place. Throughout a 40 minute jog, they remained snug. They were also lightly tested during hiking, cycling and even skateboarding – and in each activity they did not raise any issues. One of the more unique features that we noticed about the TaoTronics TT-BH07U Headphones is their magnetic ability. Each ear bud is equipped with a magnetic backing that allows users to clasp them together, around their neck, while not in use. This gives an easy and perfectly useful way to keep them out-of-the-way but still within reach when you’d like to resume listening. They can be worn as a necklace and you won’t need to worry about losing them or having to place them in a pocket while not in use. Utilizing the latest in Bluetooth 4.1 technology, the TaoTronics TT-BH07U’s boast a completely wireless connection that offers true, un-tethered freedom from your device. Whether you’re using an iPad, iPhone, Android or tablet, as long as Bluetooth is enabled, they should have no issues pairing to them. The pairing process is very straightforward and nearly self-explanatory. All you need to do is press and hold the “play” button for roughly 5 seconds. You should then see the LED blink between red and blue. At this time, go into your device’s settings and select the “TaoTronics” connection. The nice thing about Bluetooth is that it’s always getting faster and more efficient with each new-version release. Being that they’re Bluetooth 4.1 enabled, they have a quicker response and lower frequency than earlier models. Best of all, you’ll only need to complete the pairing process one time per each device; no need to fumble around and manually connect them each time you’d like to use them. We found that the wireless range was quite acceptable – around 30 feet in “line of sight” conditions. There weren’t any objects or obstructions in the way between the headphones and our iPhone. However, if you begin to move out of the room or place a wall between you and your device, you can expect the wireless range to be drastically affected but still acceptable to most standards. After all, when are you going to be in a different area when your smartphone usually is always by your side? With the included micro USB charging cable, you can completely replenish the internal rechargeable battery within about 60 minutes. As for battery life, the advertised length is 5 hours, which we found to be accurate. Upon their first arrival, we highly recommend giving them a full charge, even though they come with a bit of battery life from the factory. This’ll assure that they’re good to go and ready for a long workout without any interruptions. Without a doubt, sound quality is likely the most important reason for most people when trying to select a decent pair of headphones. While it’s no secret that the TaoTronics TT-BH07U’s are a budget-friendly option and are priced much lower than their competition, we were totally surprised on how phenomenal the sound quality actually is. They excelled well with all sorts of genres of music and seemed to do well with songs that contained heavy amounts of bass while still sounding well with songs that were more mellow and/or lyrically driven. Although you can’t adjust the specific levels of treble or bass, TaoTronics seemed to do an excellent job with how they sound right out of the box. Keep in mind that the sound quality can be affected by how they fit within your ear canal. Take advantage of the bundled ear hooks and tips that they include, and spend a few minutes achieving a proper fit. We would recommend opting for a ‘sealed’ fit for the best balance between comfort and audio quality. If you shake your head and they fall out, try a smaller size. The inline controller located on the wire between the two ear buds has a small microphone built into it. You may not see it at first, but it’s a small pinhole that lets you make phone calls without having to unpair the ear buds and manually take a call. Once a call is coming through, your music is automatically paused and you’re given the option to accept or reject it by simply pushing one of the small buttons. While this may not be a useful or worthwhile feature for everyone, it can surely come in handy if you’re someone who enjoys hands-free calling on the go. 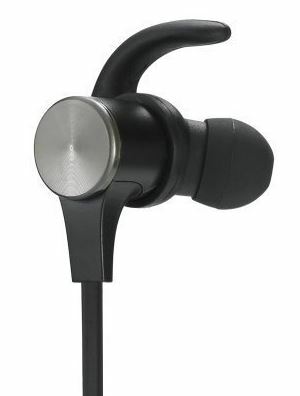 It’s also worth mentioning that they’re equipped with CVC 6.0 noise cancellation technology. This technology filters out surrounding noise and gives your voice a more true and natural sound that isn’t easily interruptible by grey noise or common distractions. It makes for clearer phone calls and less unwanted distractions in the process. While you could spend ten times as much for a studio-quality set of ear buds, most don’t have the need or the means to invest in such a pair. We whole-heartily feel that they’re valued extremely well and deliver everything as promised, without the typical exorbitant price tag of a brand name. The TaoTronics TT-BH07U Bluetooth Headphones are comfortable and built with quality in mind, although their price-point may make you think otherwise. Don’t be put off by their inexpensive retail price. It doesn’t necessarily prove that they’re low-quality or not worthy of an investment. If that was the case, they wouldn’t be as popular and widely raved about as they are. We were really happy with how they feel and their overall feel. The unique magnetic design is another added benefit. Keeping them away by wearing them as a necklace is a pretty cool trait that comes in handy for those who find themselves busy, but still want to have easy access to their earbuds at all times. 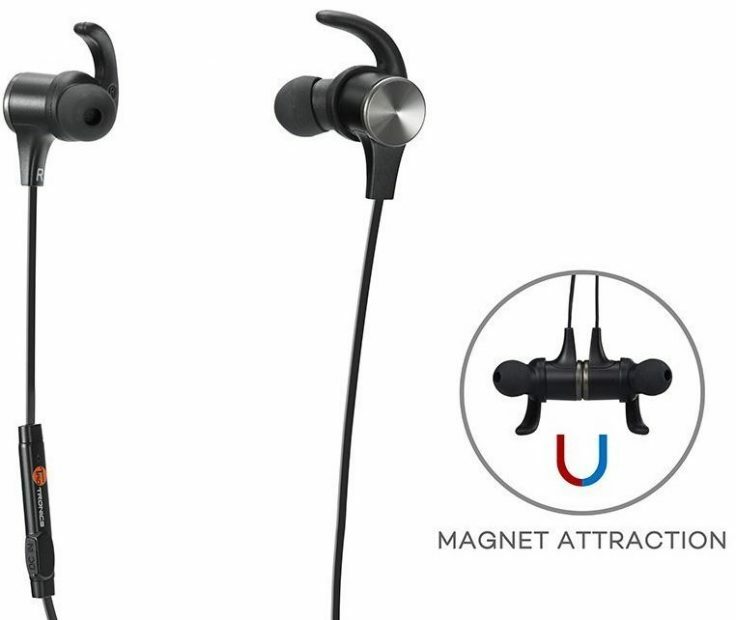 The magnets are strong and are a great addition to their aluminum alloy construction; giving them a high-end feel while remaining lightweight and durable. As far as sound quality goes, we really couldn’t ask for anything more; especially considering their budget-friendly retail price. The bass is excellent and never a nuisance. Even when the volume is cranked up all of the way, there isn’t even a hint of distortion. Just make sure that you achieve a proper fit first! Overall, we’re really happy with our purchase of the TaoTronics TT-BH07U’s and wouldn’t hesitate to recommend them to anyone looking for an inexpensive, high-quality set of wireless earbuds that won’t disappoint.